Catholics will discover Saturday at Les Invalides the Return of Forgotten Practices. In the sacristy, it is he who watches over the vestments of Benedict XVI. The pope enters, they exchange a smile, already focused on the Mass which the Successor of Peter is preparing to celebrate. Monsignor Guido Marini, a young Italian prelate of 43 years, is the Master of Papal Liturgical Celebrations. His childlike face shows a very precise look. No detail seems to escape him. 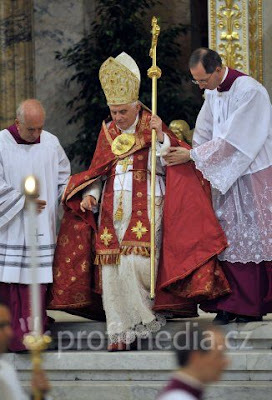 Thin, tall, he respectfully assists the pope in putting on his vestments. Then come a time of prayer. The Mass can begin. Saturday morning, behind the altar installed on the Esplanade des Invalides, Monsignor Guido Marini in the same way will help Pope Benedict XVI. In October 2007 he himself appointed the young prelate to this more than sensitive position. He is in charge to order, down to the second, the Masses of the Pope: from the choice of vestments and liturgical accessories to the singing, not forgetting the choice of chalices and through to postures of the body. It is the formal style of the celebration of the Eucharist which rests in his hands. When one knows the commitment of Benedict XVI to beautiful liturgy, he could not have randomly selected the one who has replaced another Marini, Piero Marini, whose face is better known as he was the Master of Celebrations of John Paul II for two decades. Indeed, the master of ceremonies is always within two steps of the Pope during major celebrations. An exposed position, therefore, media-wise and even more so ecclesially. The young Guido Marini knows something about that. In recent months, he concentrates on him praise but also criticism. He embodies the return of tradition. The reason are the liturgical "innovations" for the Mass of the Pope, which are all resumptions of elements forgotten in recent years. But it is true that in matters of liturgy the smallest symbol is fraught with meaning. So many "novelties" which reassure some, but trouble part of the Church, or even annoy those who denounce this as "a step backwards". It is said that certain people were somewhat shocked by these requests, when Monsignor Guido Marini came to prepare, in mid-June, the Pope's voyage this week. Regarding, in particular, the question of communion in the mouth kneeling. If Monsignor Guido Marini is not for nothing in these developments, it would betry poor knowledge of the operation of the Holy See to imagine that he is the sole person responsible for this. Particularly since there is in the Catholic Church a "ministry" in charge of these issues: the Congregation for Divine Worship and the Discipline of the Sacraments. If he advises, the Pope decides. It is therefore Benedict XVI himself who wishes this new course. The choice of this master of papal liturgical celebrations has been recommended to him by his Secretary of State, Cardinal Tarcisio Bertone, the number 2 of the Holy See, whose master of ceremonies Monsignor Guido Marini was when he was archbishop of Genoa, a priest noticed there for his pastoral charisma, of a mild temperament and attentive to everyone, qualities he has not lost apparently in the Vatican. He holds a double doctorate in law, civil and canonical, and a litentiate degree in psychology of communication. In his bright office at the Vatican, at the corner of St. Peter's Square, Msgr. Marini explains: "Benedict XVI wants to emphasize that the norms for distributing Communion in the Catholic Church are still in force. One has indeed forgotten that the distribution of Holy Communion in the hand is due to an indult, an exception, one might say, given by the Holy See to the episcopal conferences that request it." He recognizes that Benedict XVI has a "preference" for communion in the mouth but that "the use of this modality does not detract from the other modality, to receive the host in hand." However, he observes, "to receive the host in the mouth highlights the truth of the Real Presence in the Eucharist, it helps the devotion of the faithful and introduces more easily into the sense of mystery. So many aspects it is important to stress today and urgent to recover." Nothing, therefore, of a papal fantasy. 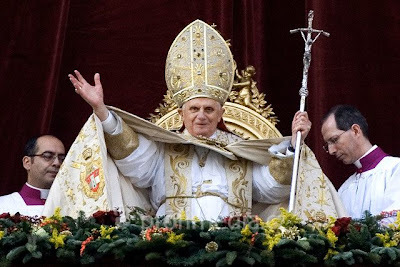 These changes in liturgical forms are part of a clear vision of Benedict XVI and explicitly expressed in Rome by several interlocutors close to him: "To achieve, ultimately, a liturgical synthesis between the Mass of Paul VI and that which tradition can contribute to it as enrichment." As for the method to get there, it refuses the trails of a new liturgical war, but it intends to rely on "teaching" and "patience". Still according to the proponents of this issue, the Pope intends to counterpoise "by example" the "deficiencies" that he has always denounced since the 1970s: the lack of "recollectedness" and "silence"; the loss of the "sense of the sacred", which he also calls the "cosmic" sense of the liturgical celebration where, according to Catholic theology, and also Orthodox by the way, "God Himself, through the Incarnation of the Son, makes Himself really present in the consecrated host." "Serving the Sense of the Sacred"
Monsignor Guido Marini is formal: "It is not a battle between the old and the modern, much less between the preconciliar and the conciliar ones. This kind of problematical ideology is today outdated. The old and new belong to the same liturgical treasure of the Church. The liturgical celebration must be the celebration of the sacred mystery, of the crucified and risen Lord. 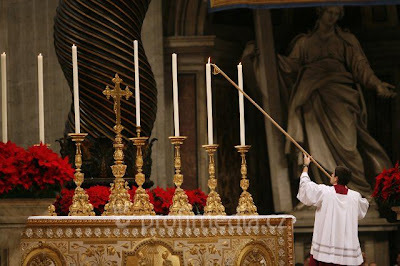 It is our task to find, in the heritage of the liturgy, a continuity to serve this sense of the sacred." And he points out, in passing, that many focus on the four or five developments of recent months without seeing that he works just as much with the "legacy" of his predecessors, among whom Archbishop Piero Marini. "There is no break with what was being done before," he assures. As for the use of the papal throne or old mitres, it is not systematic [in the sense of "exclusive"]: they are used "only on some solemnities." 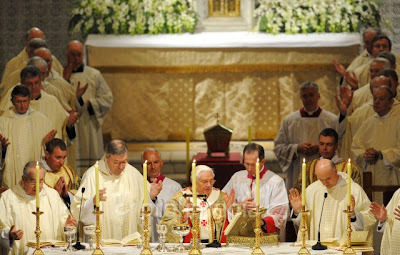 No rupture, certainly, but this movement of gentle reform of the liturgy, as symbolic as it may be in its appearances, is firmly rooted in the thought of Benedict XVI. He has never hidden anything before becoming pope. In his memoirs, My Life, Memoirs 1927-1977 [published in English as "Milestones"], published ten years ago in France at Fayard, Joseph Ratzinger showed his colours regarding the liturgical reform of the Second Vatican Council which he had lived at the age of 40: "I was dismayed," he wrote, "at the ban on the old Missal, since such a development had never been seen in the history of liturgy. (…) A renewal of liturgical awareness, a liturgical reconciliation that again recognizes the unity of the history of the liturgy and that understands Vatican II, not as a breach, but as a stage of development: these things are urgently needed for the life of the Church. I am convinced that the crisis in the Church that we are experiencing today is to a large extent due to the disintegration of the liturgy (…) This is why we need a new liturgical movement which will call to life the real heritage of the Council." As a fine connoisseur of Roman life says, Fr. Federico Lombardi, an experienced Jesuit who heads Vatican Radio and the Press Office, one must be wary of "interpretations" that would lead to consider these developments as a revolution. But everything suggests that this "new liturgical movement" is well and truly launched. Benedict XVI does not envisage disseminating it by way of regulations, but by the force of example.